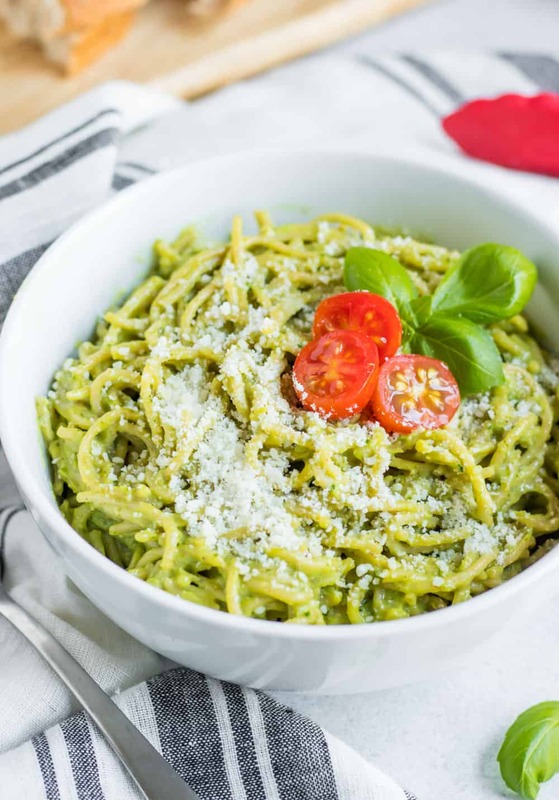 Creamy Avocado Pesto Pasta is a perfect recipe to whip up in no time for dinner. 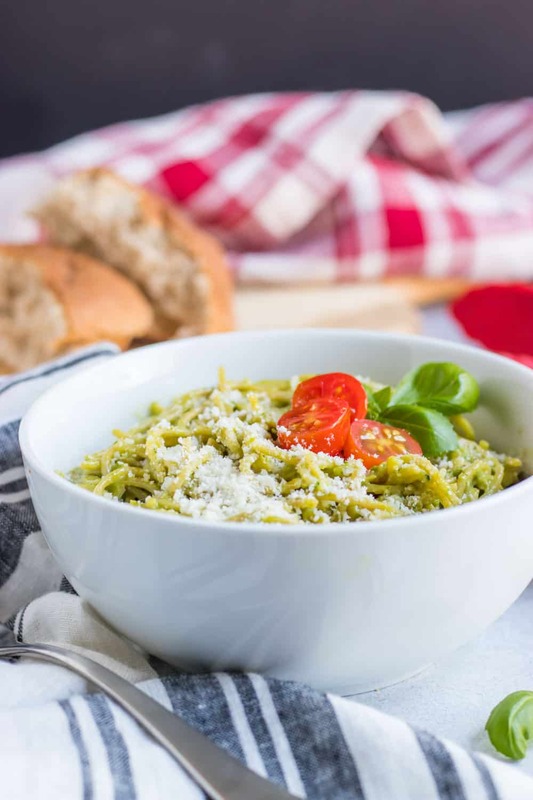 Parmesan, fresh basil, walnuts and a few other ingredients are all you need for a simple dinner the whole family will love! That is THE topic today. For so long, movement for me was solely for the sake of burning calories. It was a chore, it was punishment and something I forced myself to do, even when my body begged for rest. And the type of movement always had to be the one that would maximize the calorie burn. Yea, it was exhausting. And that’s how I lived. For a LONG time. It wasn’t until I started practicing yoga about 6 years ago that I started to shift my perspective on the whole concept of movement. It was the first time that the word ‘exercise’ separated itself from calorie burning. It was the first time I began to see movement as more than a sentence to the criminal offense of overeating. It was the first time that I fully appreciated and acknowledged that this whole concept of movement was so much more. And most of all, it was the first time I started to respect my body and its needs. I use the term movement over exercise especially because I feel it is so much broader in the sense of what is categorized as movement versus exercise. I also use the term movement as it has more of a positive connotation and that it can even be more therapeutic. Trust me, exercise can certainly be therapeutic, but using the word ‘movement’ can just put it all into one larger scale spectrum. Okay, so our bodies need to move. They were made to move. It’s why we have muscles and joints, a skeletal system, etc.–sorry, that’s about as scientific as I get, friends. But you get the point, it’s just in our genes, our make up. And at some point in our lives, we learn that movement has an impact on us. There are a lot of positives that come about as a result of it. There can be negative things as well such as injury perhaps, but plenty of positive. We also learn that through our movement, we can actually manipulate our bodies. What do I mean by that? We learn that through our exercise, we can tighten or shrink parts of our bodies. So at some point, for some of us, exercise and movement becomes just that: a way to shrink our bodies. And often, we don’t consider our genetics, we don’t consider the consequences over time, and we don’t consider that the media is not all reality. We just want to be skinny. And we don’t care how exhausted we are, we will burn those calories. Whew. So that’s the cycle I got caught up in for a decent chunk of my late teens and into much of my twenties. It wasn’t overnight, but as I began to practice, I noticed how amazing I felt even though I hadn’t just gotten my behind kicked as I was so used to in other workouts or forms of movement. I noticed that I wasn’t thinking, “ok, how many calories did that burn?” and yet it was suddenly okay. I wasn’t moving for solely for the sake of those tighter abs or slimmed down thighs. I was moving because it felt good. What a new concept for me! Over and over and OVER the teacher would tell me I could take child’s pose if I needed rest, but I still thought, NO WAY, I am not wimping out. But then one day, I was so exhausted. And I finally took that permission she was giving us. I sat back on my heels, rested my head and stepped back. I took child’s pose. And I didn’t give a damn what anyone else did. And I didn’t worry about the fact that I wasn’t “maximizing” my time spent moving. None of that happened. My body told me it was time to rest and for the first time in my life, I actually listened. Mind. Blown. It still took a lot of time to peel all of the layers away that years and years of overexercising had piled on. I still found myself in and out of my old ways. I went through the Fitbit phase which essentially was a downward spiral right back into that place. So I tossed that thing away and haven’t looked back. Great for some, not for me. But the thing that has been coming up for me lately is the concept of an all or nothing mentality around movement. The other day as I was on a walk, the old thought process crept up. I was perfectly happy on my walk, but a voice inside told me that if I really wanted to make the most of this walk, then really, I should be running. (If you know anything about me, you know that I HATE running. It’s probably the only thing I will ever attach the word ‘hate’ to in fact.) This thought process proceeded for several minutes and I started to get discouraged because it was as though this perfectly nice walk wasn’t even worth it because I really wasn’t giving it my all. I really wasn’t challenging myself, and if I wasn’t being challenged, then what was the point. And then, as if by divine intervention, the podcast I was listening to spoke up, and in a big way. I listen to the Food Psych podcast pretty regularly, but somehow had missed one and was catching up on it. I wasn’t focusing completely until I heard them saying that sometimes your movement for the day is folding laundry, and that is all it is, and this is okay. I honestly have no idea what they said after that because I went back to my conversation with myself to scold my inner thoughts for even trying to make me feel bad about the way I was choosing to move. Today I needed a walk. I needed to breathe in some fresh air and smile at the dog’s shadow bouncing on the sidewalk. That is the way I needed to move today. And perhaps tomorrow, a really sweaty boxing session is what I will need and I will go all in and it will be perfect. Or maybe it will be a restorative yoga session. Whatever it may be, my body will let me know what I need, and I will try to listen to it. Sometimes we need to move in a way to push ourselves and we need to be challenged. Sometimes we need movement that is healing and meditative. And other days, all we need is to fold the laundry. And all of it is okay as long as you are listening to exactly what your body is telling you. And if you have to tell your mind to quiet down for a sec so that you can hear what your body is saying, then do it. And whatever you do, don’t fall into the place that says movement is only for the sake of burning calories. Trust me, it is so much more. Ok, you know the drill around here. First we have some food to nourish the mind and then we talk about some food to nourish the body. At any rate, let’s talk about food and what is on the menu for today. When it comes to recipe development, my comfort zone is in breakfast and treats. Dinner recipes are fewer and farther between and I am not exactly sure why, but when I analyzed all of my recipes, I noted that my dessert/treat page and my breakfast page make up over 50% of all my recipes. I mean, a girl loves what a girl loves, right? And to be honest, we now eat breakfast for dinner at least once a week so that should count for something! But I have also noticed that Anthony and I have been getting bored in the dinner department so it was long overdue to start playing around here. First thing’s first, we hit a huge milestone recently in our household recently. Anthony ate zucchini noodles. And liked them. And requested them again the next week. So I may just have to make this Avocado Parmesan Pesto Pasta for him again but with ‘zoodles’ and see what he thinks. I am working on my veggie garden this week and am very glad I waited so long this year as we had a frost advisory all weekend. The one thing I am doing differently this year is potting all of my herbs and spices. Those things run wild and I am keeping them under control this season! Especially cilantro. My favorite to eat and least favorite to tame. Every year I swear there is more and more learning. And there is NOTHING like walking to your backyard and grabbing some fresh basil to make pesto. Or really to add it to anything. So convenient and so cost effective. What I love about this recipe is how little time it takes to make. 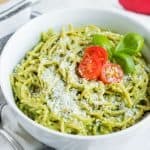 You boil your pasta and then toss all of the pesto ingredients into the food processor and then whip everything together and you are ready to eat. Not time at all. I find it also makes a great side to a meal as well if you don’t want full on pasta. And we already know the avocado just makes all recipes better, right? You never have to tell me twice! Cook spaghetti according to package. Reserve about 1/4 c of the water pasta was cooked in when draining and set aside. 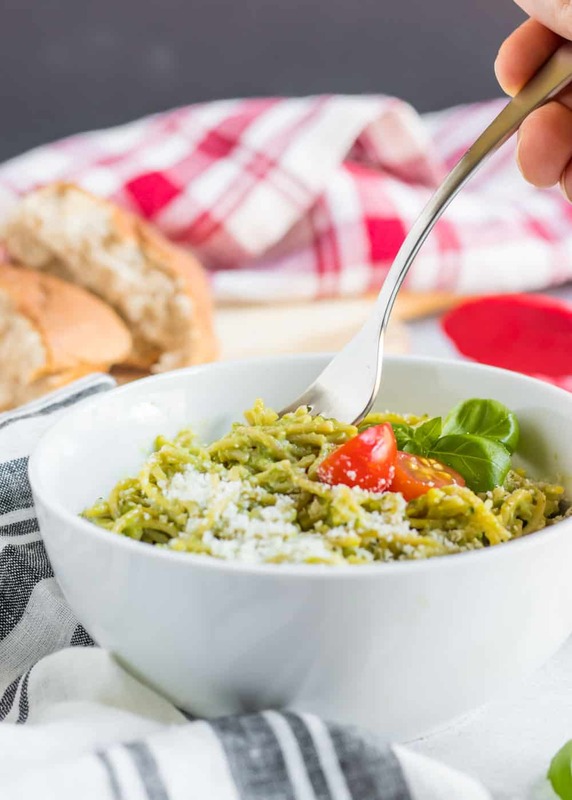 Add all ingredients for pesto into a food processor. Process until smooth. 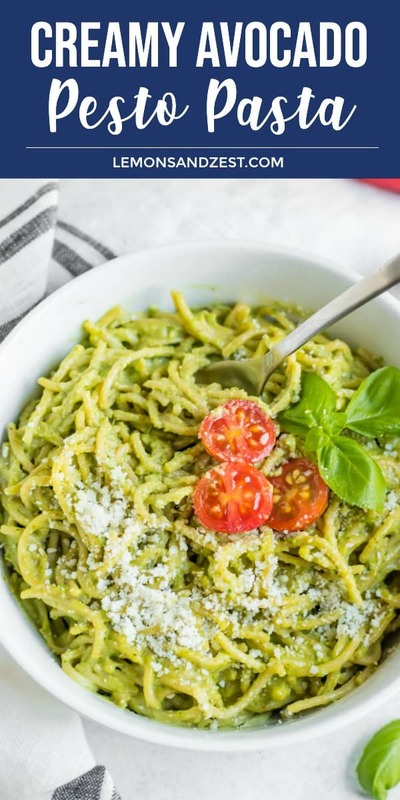 Add desired amount of pesto to freshly drained pasta and toss to coat evenly. Heat over low heat for about 2-3 minutes so sauce warms. Slowly add in a tablespoon at a time of the reserved water to thin out the sauce if it seems thick. If not discard the water and serve immediately. 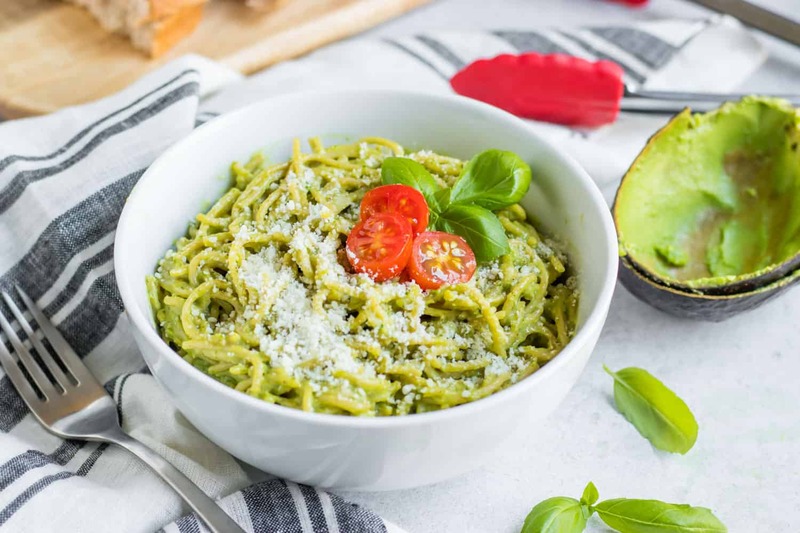 I never would’ve thought to put avocado in pesto. So smart! Ups the game for sure!!! Anything with avocado I am game for! This is such a fun pasta dish for the holidays too! You and me both, Meme! I loved the fresh squeeze of lemon, so good! Always the simplest game changer! 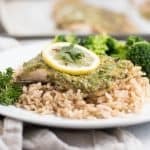 I love adding walnuts to pesto, this was a perfect weeknight dinner for our busy week we had !! Thank you!